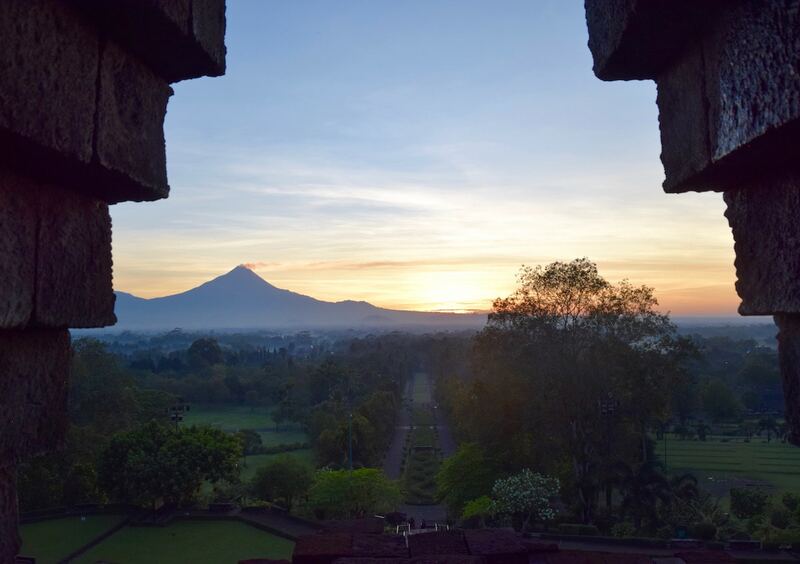 Sunrise at Borobudur is definitely worth setting your alarm for! A slither of a crescent moon hung in the sky surrounded by tiny glittering stars. The air was fresh and still. It was beyond quiet. The only other lights around? Twitching torch lights flicking from step to step. 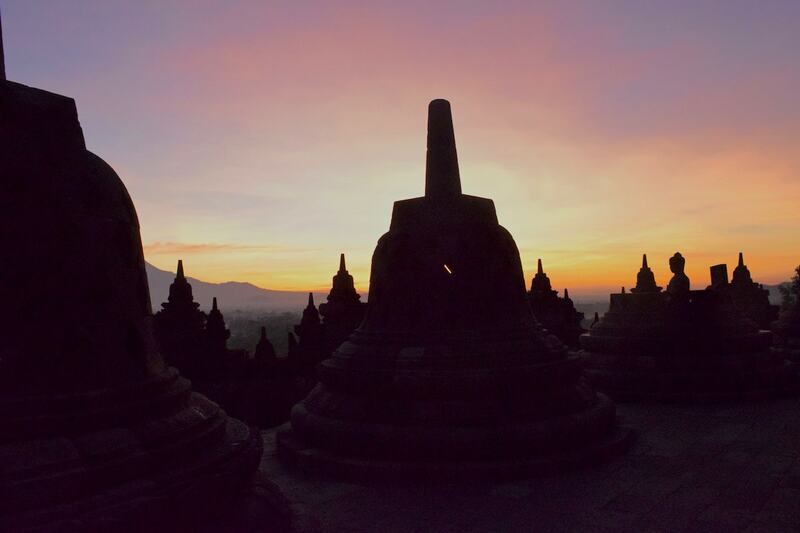 This was the start of sunrise at Borobudur, and all we could do now was find a spot and wait. 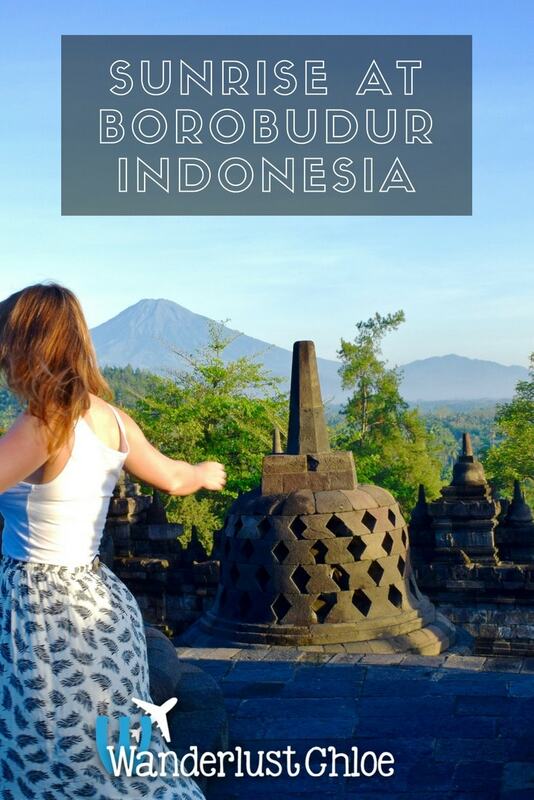 Check out my video of sunrise at Borobudur, plus see what I got up to in Yogyakarta and at Prambanan Temple. It’s funny arriving somewhere like this in the dark. As I climbed the 118 steps to the top I wondered what was surrounding me. 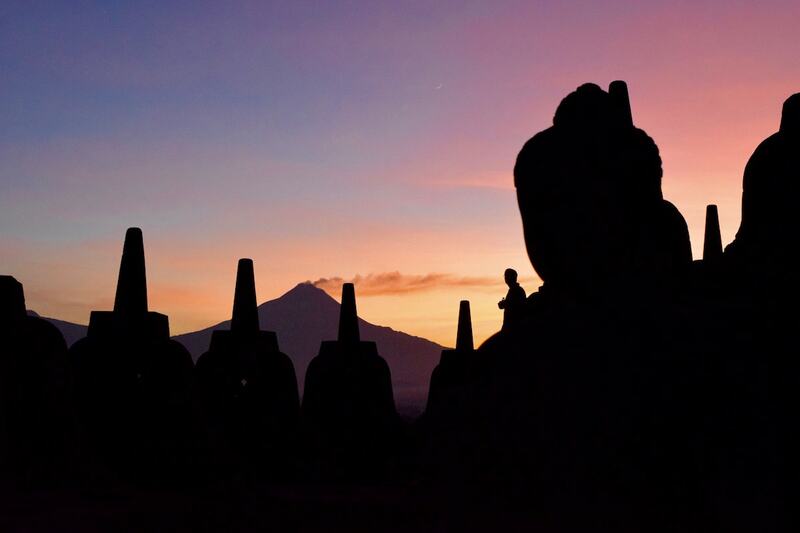 As the light started to change, the silhouettes of the stupas and buddhas came into view. They were large, impressive, and beautifully illuminated. 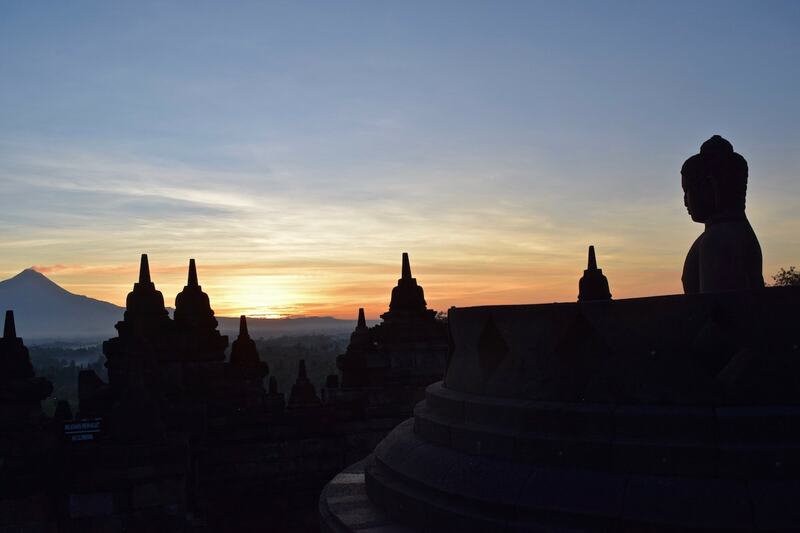 Sunrise at Borobudur was going to be an unforgettable experience. The colour of the sky started to change, as if an artist was painting and repainting as the seconds ticked on. It went from a rich shade of blue to purple, to pink , to orange, and then settled on a luxurious shade of gold. Sun spheres peeked through from behind the buddhas and began to illuminate details on the stone. But then I looked around and realised part of the beauty wasn’t on the temple itself, but lying below it. 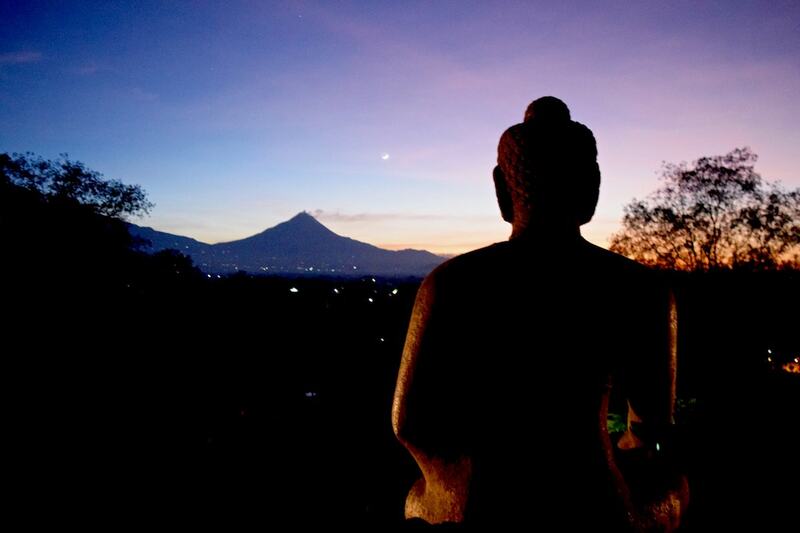 The region is covered in thick jungle and surrounded by volcanoes, including the smoking Mount Merapi – one of the most active volcanoes in the world. 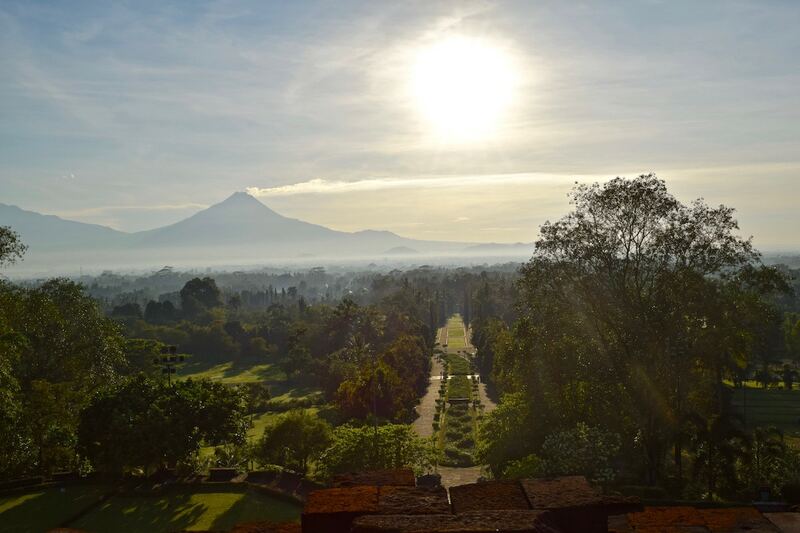 A thick band of mist hung over the jungle, effortlessly absorbing the shimmery sunlight. I’m not going to pretend I was alone. 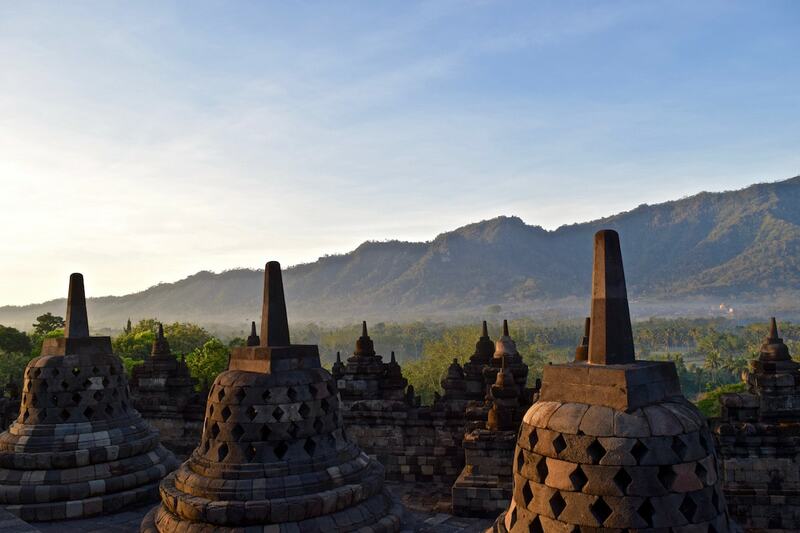 Borobudur is the most visited tourist attraction in the country, but it wasn’t overrun at sunrise (as I imagine it could be later in the day). Those who’d made the early start were respectful and it was eerily quiet. I guess it’s one of those moments you want to take in and remember forever. No distractions. As the light came up, the sky’s appearance changed numerous times, and just when I thought I’d taken the perfect photo, it felt like the view got better and better! After sunrise it was wonderful to wander around the temple and take in the smaller details. 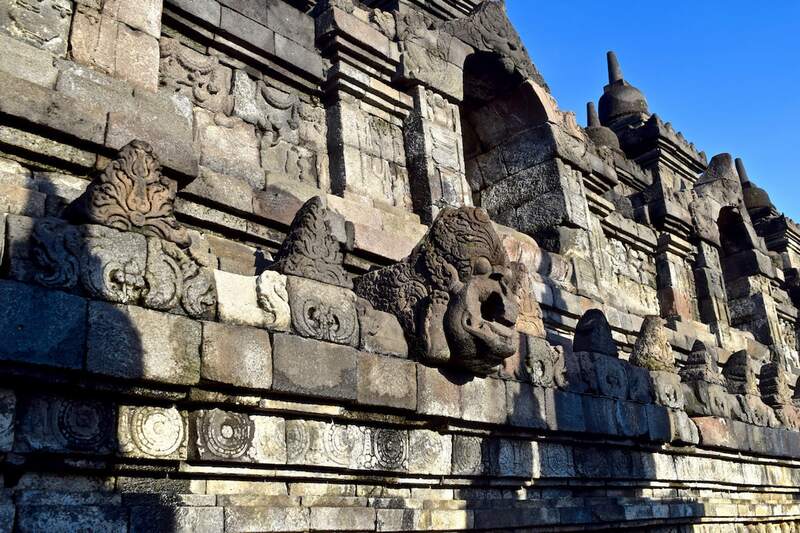 Ornate symbols, towering archways and hundreds of stupas, large and small – it was crazy to think how long ago it was created. 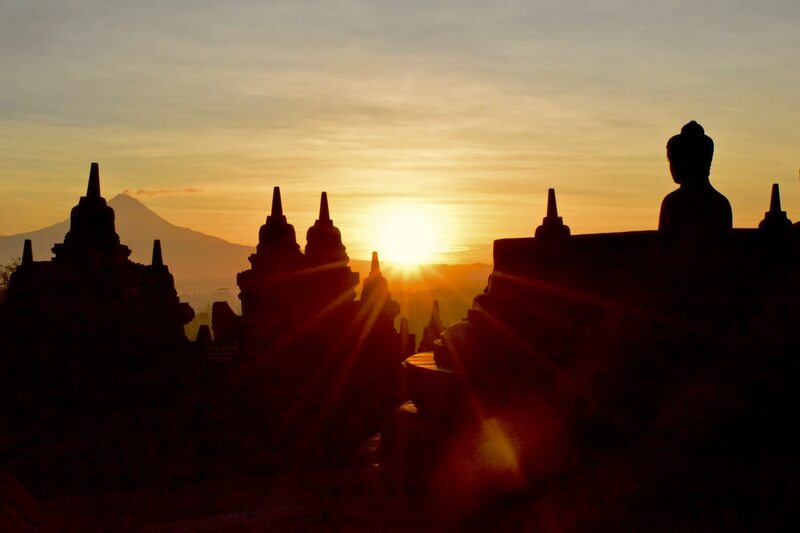 While visiting Borobudur during the day will still be an awe-inspiring experience, sunrise was absolutely mesmerising. 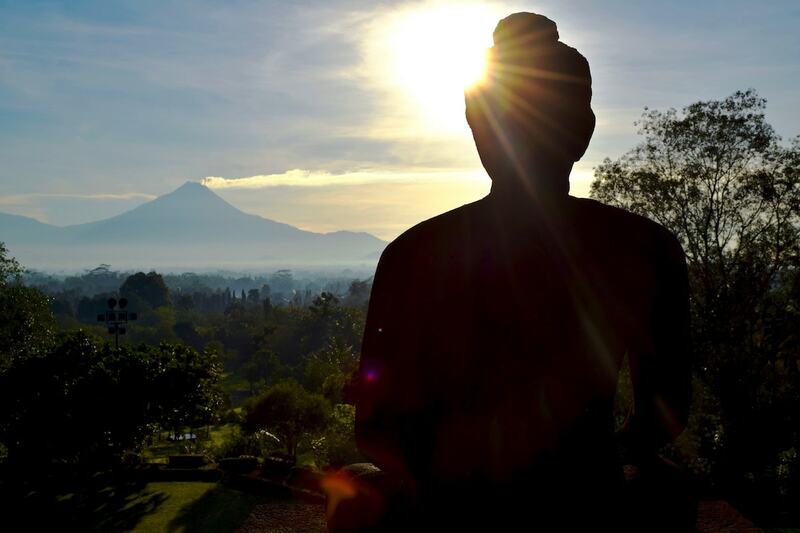 Now I’m back, I can honestly say it was one of my highlights of my month in Indonesia. 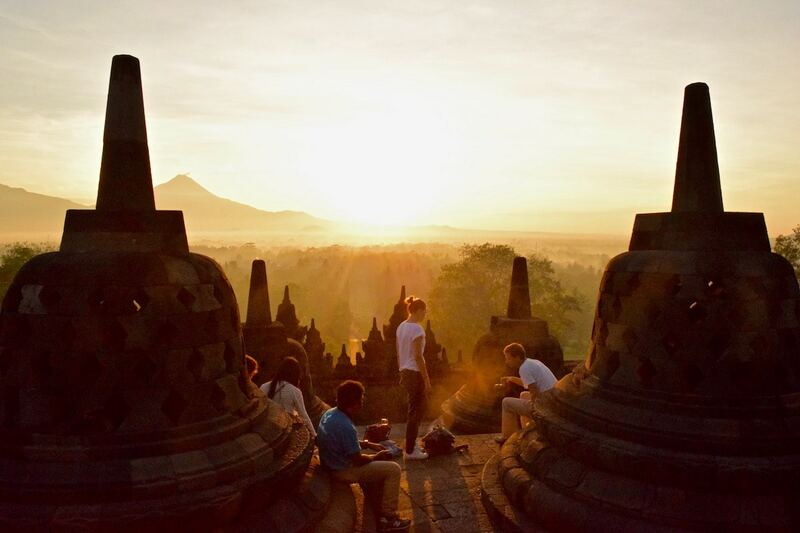 A sunrise ticket for Borobudur costs IDR 400,000 and allows you entry at 4.30am. 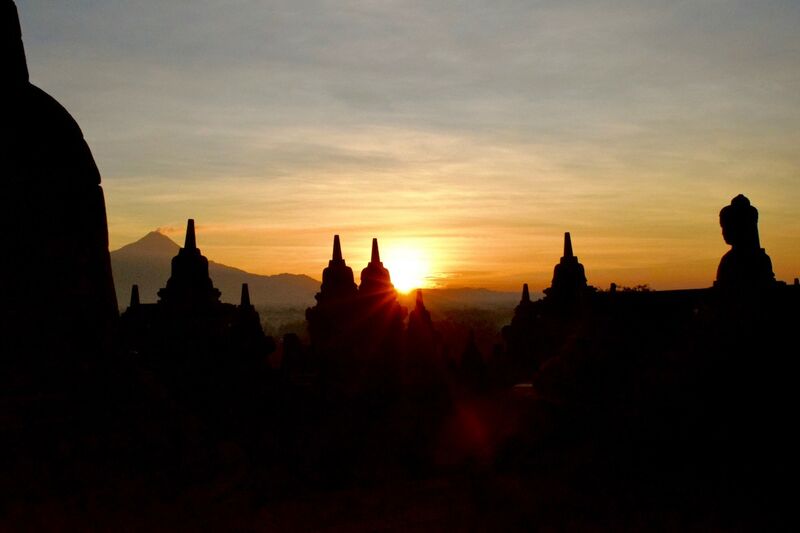 You can find out more about the Borobudur sunrise tour packages here and book tours of Borobudur and Yogyakarta here. It’s early, but as it’s such a warm country, it wasn’t cold when we visited. However, I’ve heard that at times there can be a chilly wind in the air and when it rains in Indonesia, it really rains! Take water. The climb is steep and you’re likely to be there for an hour or two. 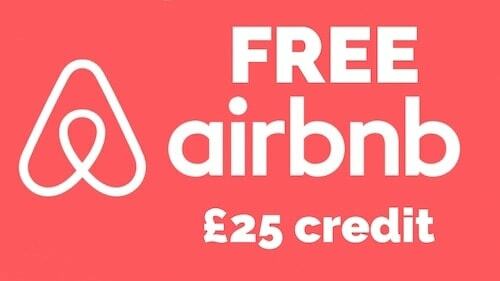 You can buy a few drinks and snacks, including coffee on arrival. 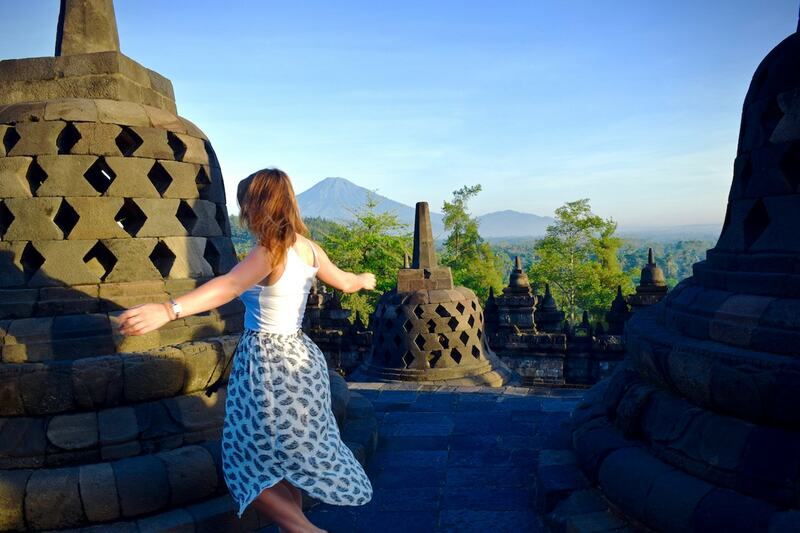 While you should always dress respectfully, you aren’t required to cover your legs or wear a sorong at Borobudur. If you’re keen on photography, research angles and decide what you’re trying to achieve. 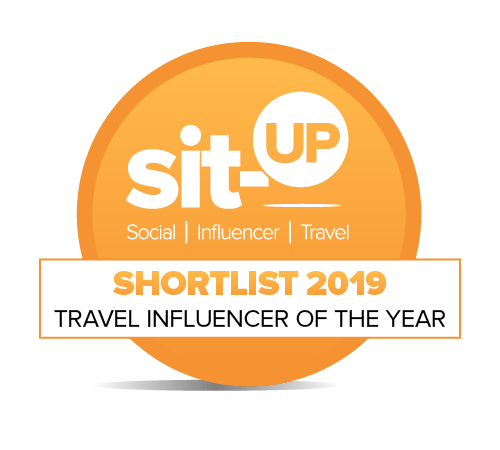 You might want to position your tripod quite early so no one steals your spot on arrival! I wore flip-flops and I was fine. There are a lot of steps so make sure whatever footwear you pick is nice and comfortable. Enjoy it – put the camera down for a second and take it all in. 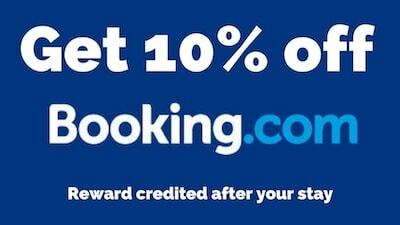 This is one experience you really won’t want to forget! 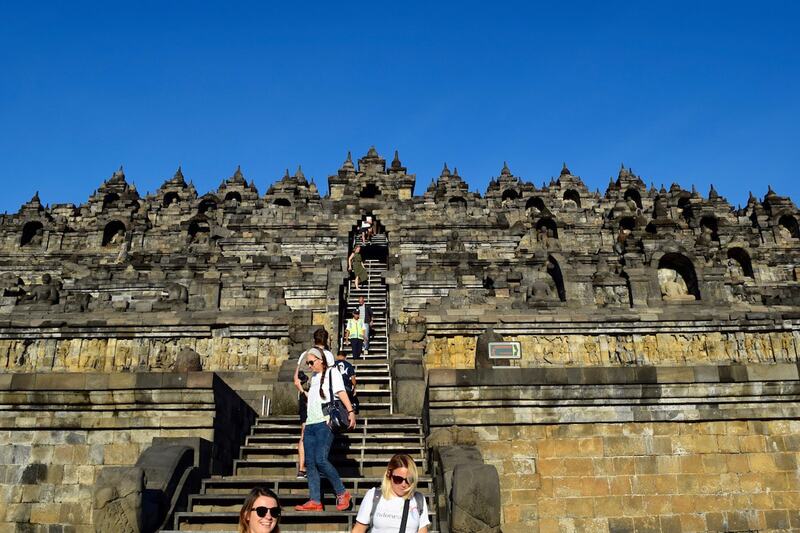 Find out more about visiting Borobudur and Prambanan temples. Huge thanks to the Indonesian Ministry of Tourism for inviting me on the #TripOfWonders as part of their #WonderfulIndonesia campaign. As always, opinions are my own! 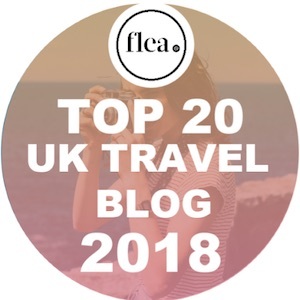 Ah thanks Sher – can’t wait to see yours. It was such a magical morning!